Rhumba is a photograph by Cheri Randolph which was uploaded on January 20th, 2013. 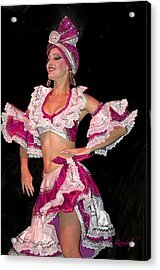 Shown in this photograph is one of the beautiful exotic dancers of the Tropicana Club in Havana, Cuba. Tropicana (1957), a Mexican musical comedy filmed on location at the cabaret and featuring some of the Tropicana's performers. Note: This image has been processed using a painting filter and will be more effectively printed on a matte surface paper such as Somerset Velvet or watercolor paper. Going as a fav. Such wonderful colours - full of life. Karen, I am complimented that you listed "Rhumba" as one of your favs. Thanks for visiting! Nina, Glad you enjoyed this one. Thanks for commenting! Douglas, thanks for your nice compliment and the f/v also. You're correct about the energy - it was one of the most lively dance performances I've seen. Gary, Many thanks! I appreciate your comment and such nice support! Thanks, Joan! I really appreciate your support! Mukta, Thanks so much for selecting this one! I appreciate your vote. Heidi, I'm glad that you enjoyed the photo and the description. Sure appreciate your vote! Byron, Thanks for your nice compliment & the vote. Randy, thanks for your compliment and the F/V! I appreciate your support! Thanks, Kay! Glad you enjoyed this one & I appreciate your v/f! Kaye, You're welcome! Glad that you liked this one & I appreciate your vote! Love dancing, Cheri... and love your image, colors and texture. Voted. (Thanks for your congrats). Cheri, I love, love, love this! 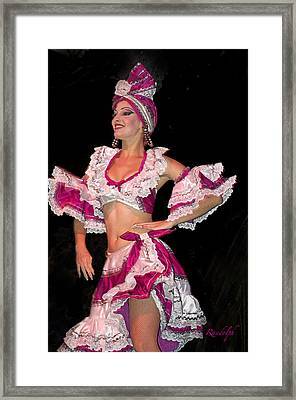 I mean who doesn't love a Cuban dancer from the TROPICANA! how fantastic you got to go there! I like that you wrote about Ricky Ricardo in the description.. I love how your signature watermark matches the fuchsia dance outfit! The black background...soooo beautiful Cheri! you are soooo talented! Voted, favorited.. and google plus..
Kym, Thanks SO MUCH for your positive and fun comment! I am sincerely grateful that you enjoyed it so much, plus that you were considerate enough to promote it as you did. Bob, Many Thanks! Appreciate your compliment and the v/f as well. Thanks, Odd. Appreciate your compliment!